We're only hours away from what we expect is the launch of the Samsung Galaxy A90, along with a range of other Galaxy A handsets, and that leaves time for one more leak. As the images show, there's a panel at the top of the phone which can be extended. When it's down it houses the three-camera rear setup, but when it pops up there are also three cameras facing forward too. We'd heard rumors of this massive pop-up panel before, and if the leaked images are real it makes for an interesting new feature. 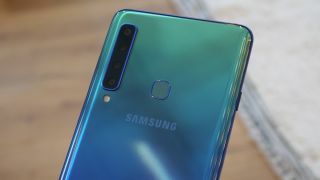 Pop-up front-facing cameras are becoming a new trend in smartphones – we're expecting the upcoming OnePlus 7 to have one – but these are usually small, and only house one or two cameras, but the Samsung Galaxy A90's panel apparently takes up its whole width. Another product we're expecting to see is the Samsung Galaxy A80, and the scores from a benchmark test have just been leaked. In a multi-score test run by SamMobile, the Galaxy A80 apparently scores 6732, which is a fair score for a mid-range device. The test also suggests the handset will use a Qualcomm chipset, but which isn't specified. We won't have long to wait before we find out everything we need to know about these phones – the launch event is later today, and TechRadar is there to cover it. You can follow our Samsung Galaxy Event live blog for up-to-date information and our expert analysis, or watch a livestream of the event yourself when it starts in a few hours.